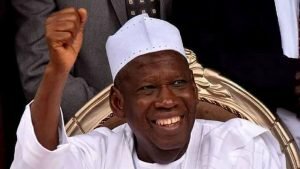 Kano state governor, Dr Abdullahi Umar Ganduje, has directed the immediate payment of registration fees for the National Examination Council (NECO) of students in public schools who failed the qualifying examination in the state. Ganduje also warned principals of public secondary schools in the state against taxing the students. The state Commissioner for Information, Youth and Culture, Malam Muhammad Garba disclosed this in a statement made available for newsmen in Kano on Monday. He said the gesture was part of government’s efforts to support parents in paying examination fees for their children. He said the sum of N424,952,000.00 at N11,000 per head will be spent for the total number of 38,632 students as registration fees. He added that the measure was aimed at ensuring that the less-privileged enjoy better education in the state. The governor reiterated that the state government would not relent in its determination to bequeathing the best of education to its citizens at all levels. He warned principals of secondary schools to desist from taxing any students before collecting his/her examination results as it was alleged, pointing out that the state government would soon launch an investigation to find out the veracity of the accusation. He urged parents, guardians and care-givers to join hands with the government to ensure that their children not only get the desired education but are also inculcated with good morals for the betterment of the society.